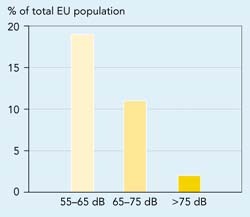 About 120 million people in the EU (more than 30 % of the total population) are exposed to road traffic noise levels above 55 L dB. 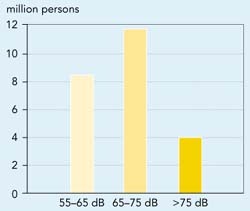 More than 50 million people are exposed to noise levels above 65 L dB. Note: the category 45<55 dB is not included because of lack of data. Reduce number of people that are exposed to and annoyed by high traffic noise levels (i.e. noise levels which endanger health and quality of life). % of population exposed to four transport noise exposure levels (in LDN) 2: 45<55 dB, 55-65 dB, 65-75 dB and >75 dB. % of population highly annoyed by traffic noise of the various modes. Noise affects people physiologically and psychologically: noise levels above 40 dB LAeq can influence well-being, with most people being moderately annoyed at 50 dB LAeq and seriously annoyed at 55 dB LAeq. Levels above 65 dB LAeq are detrimental to health (WHO, 1999). Overall, the external costs of road and rail traffic noise have been estimated at some 0.4 % of GDP (ECMT, 1998). Community noise emission limits have been considerably tightened since 1972 and legislation now sets maximum sound levels for motor vehicles, motor cycles and aircraft. However, methodological inconsistencies (non-harmonised indices and inadequate testing procedures for vehicles) have hampered progress on urban acoustic quality standards and severely limit the accuracy of noise assessments. The Green Paper on Future Noise Policy (CEC, 1996b) was the first step in the development of a Community noise policy. The European Commission is currently preparing the future Community noise policy, assisted by a number of working groups. The policy will focus on: indicators, exposure/impact relationships, computation and measurement, mapping, exchange of experience on abatement action, research and development, and the measurement of costs and benefits. The forthcoming Framework Directive on environmental noise may require all cities with population above a certain threshold (possibly 250 000 inhabitants with a density of at least 1 000 inhabitants per km2) to produce noise maps quantifying noise exposure. Some Member States are already monitoring noise and setting limits to noise pollution in sensitive areas. EU-wide data on exposure to aircraft noise is currently the least reliable, but an estimate of the number of people exposed to more than 55 LDN dB around selected airports gives an indication of the scale of the problem (Table 1.3). These airports differ considerably in magnitude of traffic, fleet mix and lay-out in respect to noise-sensitive areas, and can therefore provide a representative basis for this analyses. Assessing the impact of noise requires exposure data to be transposed into annoyance estimates. A . noise annoyance. assessment at the EU level has been hampered by gaps in data and knowledge, but recent research (Miedema et al., 1998) allows estimates of annoyance to be inferred from exposure data. A first try-out of this new calculation method at the EU level suggests that around 24 million people are highly annoyed (HA) by road traffic noise higher than 55 dB (Figure 1.13).This estimate excludes the category 45-55 dB because of lack of information . However, this is a category where annoyance can also be caused. Applying a similar methodology to recent rail noise data (Lambert, 1998) suggests that about 3 million people are highly annoyed by rail traffic noise. Aircraft noise, noise with low frequency components or accompanied by vibration, and noise that interferes with social and economic activity are more annoying than other noise (WHO, 1999). However, the number of people highly annoyed by aircraft noise in the EU cannot be accurately estimated, because much annoyance is caused by noise levels of 45-55 LDN dB for which there is a lack of information. An earlier assessment (INRETS,1994) suggest that some 10 % of the total EU population may be highly annoyed by air transport noise. At present, differences in methodologies preclude comparisons between Member States. Table 1.4 gives as an example some data for Finland and Germany. the number of people whose sleep is disturbed, by transport mode. Future Community noise level targets will probably be expressed in LDEN. This measure is similar to LDN , but with an additional penalty of 5 dB(A) for evening noise. similar indicators linking noise annoyance with freight tonnage for air traffic or tonne-km for road/rail/air traffic. Another possibility for a national noise indicator, which could be introduced rapidly but may be rather expensive, is through direct random-field social surveys; this is already being done in the Netherlands on a national basis every five years. A similar type of questionnaire for use by all Member States would provide comparative results for the EU. For references, please go to https://www.eea.europa.eu/publications/ENVISSUENo12/page009.html or scan the QR code.